A very private villa consisting 3 x large king size bedrooms, with 1 x bedroom having a additional loft with two separate king singles. Situated on the forested slopes of Nusa Lembongan with breath taking views across Badung strait to mainland Bali and a short 3 minute ride to the beach and village. Rates are $380.00 AUD per night for the whole villa which sleeps up to 6 guests. For extra guests (max. 2 extra guests) there is an additional charge of $50 AUD per guest. A private 33 sqm pool and separate dining/ kitchen pavilion and gardens. The villa comes with a private bemo (taxi) and moped scooter bikes, so you can explore all the islands sites and eateries. Our friendly staff are always ready to serve you and to help make your stay, peaceful and relaxing. Please note, breakfast is not included but for a small cost, a delicious Indonesian or American breakfast can be made for you. 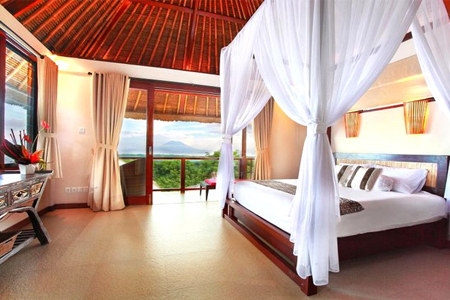 All Villa Bukit rates include Service and Government taxes. For conversion rates – click here.